NOTE: Keep the oil pump chain away from magnetic fields. 2. Remove the oil pan (see page 7-11). 3. Support the engine with a jack and a wood block under the edge of the engine block. NOTE: Do not hit the oil pump and baffle plate when placing the jack on the edge of the engine block. 4. Remove the cam chain: - All models except PZEV (see page 6-13) - PZEV model (see page 6-62) 5. Loosely install the crankshaft pulley. 6. To hold the rear balancer shaft, insert a 6 mm long pin punch (A) (Snap-on PPC108LA or equivalent) into the maintenance hole in the balancer shaft holder and through the rear balancer shaft. 7. Turn the crankshaft counterclockwise to compress the oil pump chain auto-tensioner. 8. Remove the crankshaft pulley. 9. Align the holes on the lock (A) and the oil pump chain auto-tensioner (B), then insert a 3.0 mm (0.12 in) diameter pin (C) into the holes. Turn the crankshaft clockwise to secure the pin. 10. Loosen the oil pump sprocket mounting bolt (A). 11. 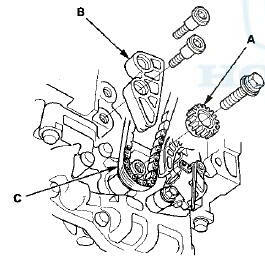 Loosen the lower oil pump chain auto-tensioner bolt (A), then remove the upper oil pump chain auto-tensioner bolt (B), then turn the oil pump chain auto-tensioner clockwise (C). 12. 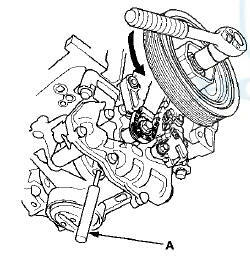 Remove the oil pump sprocket (A) and the oil pump chain guide (B). 13. Remove the oil pump chain (C). 1. Set the crankshaft to top dead center (TDC). Align the TDC mark (A) on the crankshaft sprocket with the pointer (B) on the engine block. 2. install the oil pump chain on the crankshaft sprocket with the colored link plate (A) aligned with the TDC mark (B) on the crankshaft sprocket. 3. Set the oil pump chain on the oil pump chain sprocket (A) with the punch mark (B) aligned with the center of the colored link plates (C), then install the oil pump chain sprocket to the oil pump. 4. To hold the rear balancer shaft, insert a pin driver (D) (Snap-on PPC108LA or equivalent) into the maintenance hole in the balancer shaft holder and through the rear balancer shaft. 5. Apply new engine oil to the threads of the oil pump sprocket mounting bolt (E), then install the oil pump sprocket mounting bolt and the oil pump chain guide (F). 6. Remove the 6 mm long pin punch. 7. Check the auto-tensioner cam position. If the position is not aligned, set the first cam to the first edge of the rack (see step 4 on page 8-23). 8. 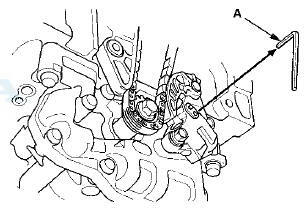 Turn the oil pump chain auto-tensioner (A) counterclockwise, then install the upper oil pump chain auto-tensioner bolt (B), and tighten the lower oil pump chain auto-tensioner bolt (C). 9. Remove the 3.0 mm (0.12 in) diameter pin (A) from the oil pump chain auto-tensioner. 10. Install the cam chain: - All models except PZEV (see page 6-15) - PZEV model (see page 6-64) 11. Remove the wood block and the jack. 12. Install the oil pan (see page 7-30). 13. Install the drive belt (see page 4-30).